The Beautyrest Diamond Knit Mattress Pad protects the mattress and provides a better night's sleep. Guaranteed to fit any depth mattress, this pad protects the integrity of the mattress while providing a softer sleep surface to snuggle into. The Beautyrest Diamond Knit Mattress Protector - Full Size has many exciting features for users of all types. 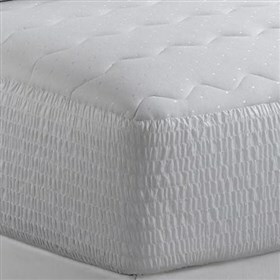 The Beautyrest Diamond Knit Mattress Protector - Full Size is sold as a Brand New Unopened Item.